The Gaza Strip is one of the most densely populated places on the planet. It is home to more than two million Palestinians living within a stretch of territory 32 miles long by seven miles wide. Since 1967, this territory has been under Israeli military occupation. While the UN Partition Plan of 1947 designated the Gaza Strip as part of a future Arab state, Palestinians in Gaza have never enjoyed total sovereignty. Between 1949 and 1967, the Gaza Strip was controlled by Egypt. After Egypt’s defeat in the 1967 Arab-Israeli War, Israel occupied the Strip. The 1994 Gaza-Jericho Agreement gave the Palestinians in Gaza some autonomy, but Israel still maintained a military presence. In 2005, Israel unilaterally withdrew its soldiers and evacuated its civilian settlers from the Gaza Strip. The next year, Palestinians in Gaza expressed their frustration with the transitional Palestinian Authority by voting Hamas into power. 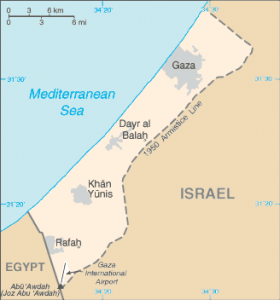 Since then, Israel has imposed a land, sea, and air blockade on the Gaza Strip. Over the past several years, there have been three military escalations between the Israelis and militants in Gaza: 2008-09, 2012, and 2014. The 2014 conflict had devastating consequences on civilians in Gaza, including the death of over 500 children. Israel’s blockade has prevented Gazans from rebuilding the extensive damage caused by these conflicts. This has resulted in an infrastructure crisis that has crippled Gaza’s economy. Electricity is infrequent, drinking water is toxic, and raw sewage pours into the Mediterranean. About half of Gazans are unemployed and 70 percent depend on foreign humanitarian aid. After the war in 2014, the UN predicted that Gaza would be uninhabitable by 2020 unless the blockade was lifted. CMEP advocates for an end to the blockade and closure of Gaza. The blockade limits the import of basic necessities and materials desperately needed to rebuild after the recent wars in Gaza 2008/2009, 2012, and 2014. The restrictions on travel have limited Palestinians’ access to health care, religious holy sites, and educational institutions outside of the Gaza Strip. CMEP also strongly condemns rocket fire from Gaza into Israel. 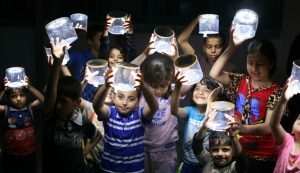 Gazan children hold Luci lights. During Spring 2017 CMEP partnered with Rebuilding Alliance to send solar powered Luci Lights into Gaza. Individuals like you raised enough funds to send 570 Luci Lights to people in Gaza. Thank you to everyone who participated!! Learn more here.